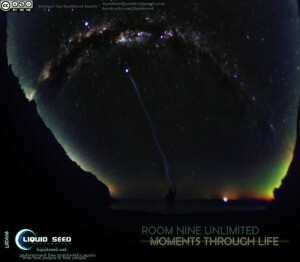 Paulo Fernandes from Portugal (Room Nine Unlimited) takes us for a 35 minutes trip on his spaceship, with Moments Through Life. It’s a story told by two chillout and four progressive trance tracks. His style leaves a mark with it’s unique sound, a crazy kick-bass flow, emotional piano scales, strange sounds, instruments, and melodies… this release can really shake the dancefloor. It’s another underground and free download from Liquid Seed Recordings that hopes to help make this world a better place. Artwork and mastering by Lagos. MP3 Download | FLAC Download | WAV Download · Download count: 14,227. Top notch! Great downtempo with beautiful arrangements. Very positive music! Great album! I’ve been using ektoplasm as my primary source of quality psytrance and related genres for about a year now, using it every day, and I have to say this is the BEST, most beautiful and stand out album I’ve heard yet. It is such a journey, no other album has taking me on a journey. Even the dark bits (on other albums I’m usually inclined to skip) I stick with because I know its part of the narrative. Yeah, this is good stuff right here. I agree I also like track #6 a lot – top notch tune.